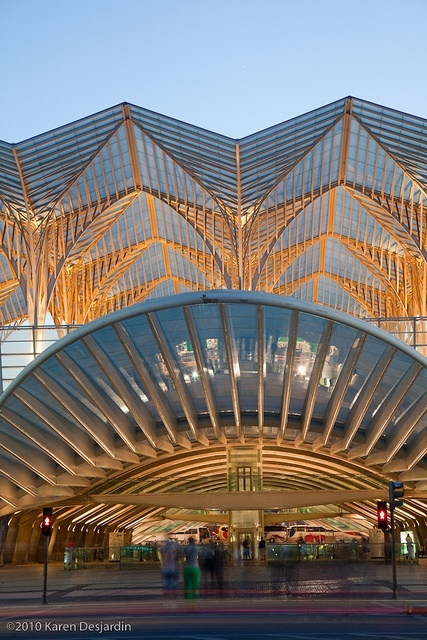 Gare do Oriente or Lisbon Orient Station is one of the main transport hubs in Lisbon, Portugal. It was designed by the Spanish architect Santiago Calatrava and built by Necso. It was finished in 1998 for the Expo '98 world's fair in Parque das Nações, where it is located. It encompasses a Lisbon Metro station, a high-speed, commuter and regional train hub, a local, national and international bus station, a shopping centre and a police station. The station bears considerable resemblance to Calatrava's earlier Allen Lambert Galleria within Toronto's Brookfield Place. Some influence from Gothic architecture can also be found. Oriente Station is one of the world's largest stations, with 75 million passengers per year which makes it as busy as Grand Central Terminal in New York.